Update: The Man Ray 1938 London Underground poster did indeed sell for a way out price–$149,000. What you see: A 1938 London Transport poster designed by Man Ray. Swann Galleries estimates it at $80,000 to $120,000. Who was Man Ray? Born in Philadelphia, Pennsylvania in 1890 as Emmanuel Radnitsky, Man Ray was vital to the Dada and Surrealist movements of the early 20th century. He was wildly creative in several media, especially photography and film-making. His art appeared in the first Surrealist exhibition in Paris in 1925, alongside that of Pablo Picasso, Jean Arp, and Max Ernst. Man Ray befriended Marcel Duchamp and worked with him often. He died in Paris in 1976 at the age of 86. How was Man Ray chosen for this London Transport poster commission? Hard to say exactly. Man Ray was living in Paris at the time. One school of thought is he went through London on his way back to the United States because of the war, but he may have designed the poster earlier than that, in 1936. He was chosen because Frank Pick, the head of London Transport advertising, was a real visionary. He employed a lot of fabulous artists and he pushed the envelope. He worked with László Moholy-Nagy, and probably through those connections, Pick became acquainted with Man Ray. Does the other poster survive? It survives, but to the best of my knowledge, none have ever come up for public auction. Apparently the design of the poster recalls Man Ray’s rayographs? A rayograph was Man Ray’s personal spin on the photogram. Objects are placed on paper, light is turned on, and shapes are left on the paper. The poster is more nuanced than a rayograph, which would not have had shades of gray. And people enjoy debating what the poster might mean? A lot have surmised what it could mean, but to my mind, it’s pretty straightforward. My interpretation is, basically, he’s comparing the London Transport system to the solar system. The image at the top is the London Transport logo, which is called a roundel. On the bottom is Saturn. The way the planets move around the solar system is the way that London Transport moves you around London. The lot notes call this poster ‘rare.’ I was under the impression it was unique? Unique means one of a kind. Salvator Mundi is unique. It’s an original work of art. Posters are never unique. Between 1,000 and 2,000 [copies of the Man Ray poster] were printed. How often has the Man Ray London Transport poster been offered at auction? There are four auction records since 1994. One sold at Sotheby’s, and the other three sold at Christie’s. I think we have the one that Christie’s sold in 1994 for $39,800. The high-water mark was in June 2007 at Christie’s, when one sold for $100,906. …I got the impression that Moholy-Nagy’s London Transport posters weren’t all that spectacular. The consensus [on lot 75, which is for Imperial Airways] is it’s a rare poster, but not that great an image. Here [with the Man Ray] you have a famous artist and an extraordinary image. He put all his technique and his creativity into the design. It’s rare, and its condition is fine. If you lined up the ten best London Transport posters and asked me to pick the one that holds the world auction record, I doubt I’d pick the Man Ray because it’s black and white, and I think of great posters as being colorful… That’s a slight misconception on your part. You’re right, great posters have great color, but great posters are supposed to catch your eye, and there’s no methodology on how to do that. This catches your eye. The imagery makes you think about what’s going on. It’s a good advertisement because it makes you think. And it might have stood out [in its time] because it was black and white. Why will this poster stick in your memory? Because for many years, it was the most expensive travel poster ever sold. That travel poster record was beaten by us in 2012 when we sold an A.M. Cassandre poster for British Rail for $162,500. In the poster world, you deal in $5,000, $10,000, $15,000 posters. It’s wonderful, out of this world, that it [the Man Ray London Transport poster] would sell for $100,000. From that point of view, it sticks in my mind as exceptional. How to bid: The Keeps London Going poster is lot 76 in the Graphic Design sale at Swann Galleries on May 3, 2018. Nicholas Lowry has appeared several times on The Hot Bid. Read past entries in which he talks about a trio of Mont Blanc posters from 1928, a mid-1930s German travel poster featuring the Hindenburg, a 1968 MoMA poster by Japanese artist Tadanori Yokoo, an I Want You 1917 World War I recruiting poster that introduced the modern concept of Uncle Sam, and an Alphonse Mucha poster featuring Sarah Bernhardt. 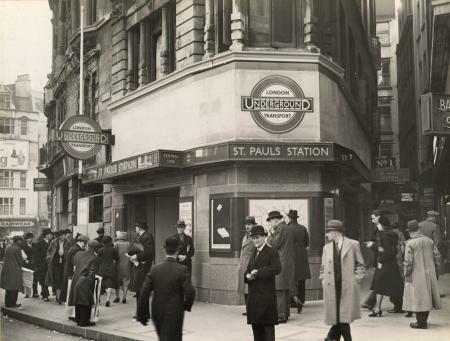 In case you missed it above, the London Transport Museum has the other poster from the pair in its online collection, and it includes a link to a period photo of the posters on display outside St. Paul’s station in London.